— Micah Perks, author of Pagan Time. To escape an addiction, a young blind man in California steps into a station wagon with his friends and their foster kids to deliver a handmade casket to a dying grandfather in Florida. As they battle their way across the southern half of the nation, this rag-tag American family falls prey to love and lies, greed and violence, crime and Katrina. With a voice reminiscent of John Irving, Nodine produces a classic “road-picture” novel that is part Travels with Charley, part As I Lay Dying, and part On The Road. Touch and Go is a rich and rangy story about the careful and careless ways we treat each other—and ourselves—in a fast-paced, changing world. Kevin, the novel’s blind narrator, is one of the most perceptive figures in recent fiction. And his desire to do no harm is contagious. Through Kevin’s rich senses and boundless compassion, Nodine gives us a multicultural portrait of a true America. And he does so with deep affection for everyone along the way. I first heard the lilt of Isa’s voice in group counseling, but I spoke with her first in a hallway, where she stopped me with a soft hand on my arm. I knew who it was before she spoke; back then she wore a cheap fragrance several traces too sweet. I turned my face to hide my scar. “You don’t have to be shy with me,” she said, bringing my chin forward with her hand. “You’re quite striking.” I drew her hand away from my chin because I wanted to touch her fingers, which were thin and long, with fingernails bitten too short. Her palm was soft. “Do you know me?” she said. “You’re right,” she said. “It’s more important how we feel.” She lifted my hand to her face and dragged my fingers through her hair. She let me feel her long neck and the way her throat jiggled as she laughed. She traced my hand along her shoulders, arms and thighs. Her skirt clung to my fingers as if the material were on my hand instead of her hips. My fingertips tingled and my breathing quickened. She had on a halter top that gave her an open back and held her breasts like pendulums; I knew because she traced my fingers along her stomach and up under the fullness so pliable and resistant through the thin cotton—all of which made me grin like a goof. Thad Nodine grew up in Florida and now lives in Santa Cruz. His fiction and nonfiction have appeared in many magazines. 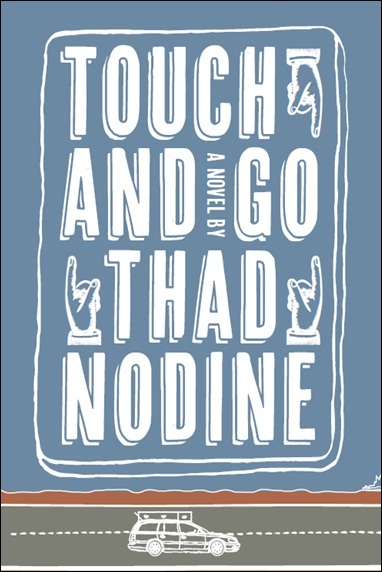 Touch and Go, which won the Dana Award for the Novel, is his first novel.